August has so far been a good growing month, a wonderful change to much of the year, thanks to higher temperatures, less rain and more sun. Summer vegetables such as climbing beans, sweetcorn and squash now have a healthy bloom, and tomatoes are ripening well undercover. Continue being careful to keep water off leaves as it is still humid, blighty weather. 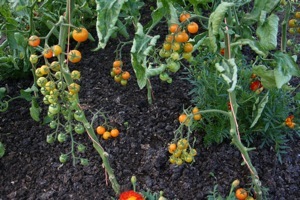 Feeding of tomatoes is necessary only in poor soil or when growing in containers and grobags. 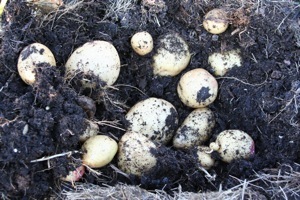 I am not feeding mine which are growing in soil with two inches of well rotted manure on the surface. 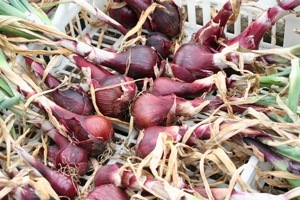 Onions should all be harvested now, if you haven’t already. 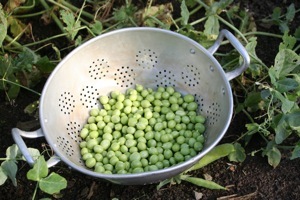 Peas are heading for final harvest and it is time for summer beans to be abundant. 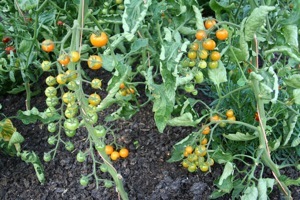 olytunnel: tomato Apero has grown well and tastes wonderful. Orchard mid August, endive & chicory in front, tall peas in distance behind the experiment. Last pick of Mr Bray off a 10 foot row. 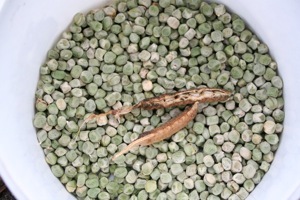 Seed can be gathered when pods are dry, for instance peas here which I grew as separate plants and never picked them. 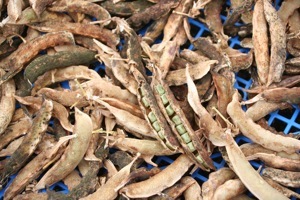 Pea Tall Sugar Snap allowed to dry on the plants, then shelled and kept awhile in the greenhouse to dry thoroughly. However, some plants may run out of time before they can mature, especially winter squashes that went in late, and Butternut above all (it needs a hot summer). Most of my squashes got well established under fleece and should be productive but I am concerned about my runner beans and Borlottis grown for seed: I am not picking their green beans, just leaving them to mature and then I hope there is time for the seed to ripen inside the drying pods before I harvest them in early October. They need a fine September. 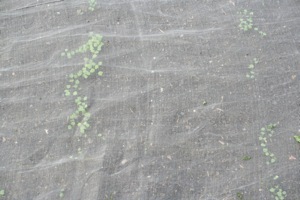 Mesh on recently sown rocket and invisible red mustard. 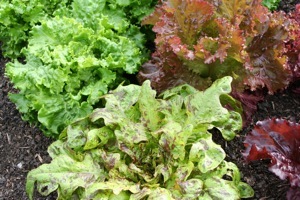 Healthy lettuce unprotected Lettony, Flashy Butter Oak, Giardina. A legacy of the earlier wet weather has been increased flea beetle damage to leaves in August, at a time when these insects are normally in decline. Perhaps they are having to eat and breed now as they couldn’t before. I have even lost some mustard plants which were eaten so hard that they stopped growing, but they were unprotected, and rocket planted under mesh or fleece has survived, although it looks more holed than is usual at this time of year. Also the mesh does seem to encourage slugs! Endive Bianca Riccia da Taglio picked of outer leaves. 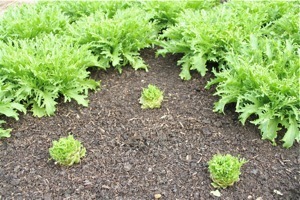 Endive Frenzy cut of all leaves and starting to regrow. It is a wonderful advantage of lettuce and endive in our climate that there are no such annoying pests, apart from the usual slugs. With leaf endive you have a choice in harvesting, to pick outer leaves or cut just above heart level, to have regrowth after about three weeks. 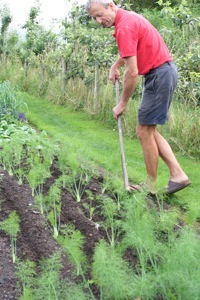 INTERSOWING experiment: drawing drills between fennel. 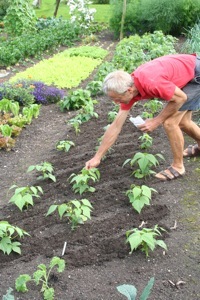 Sowing corn salad (lambs lettuce) between French beans. 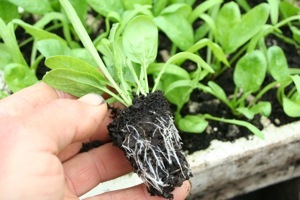 Keep sowing until month’s end if you have gaps to fill: salad rocket. mizuna and mustards for autumn harvests, then winter purslane and lambs lettuce in August’s last ten days for overwintering plants to pick in late autumn and also in the spring, as long as they survive winter. 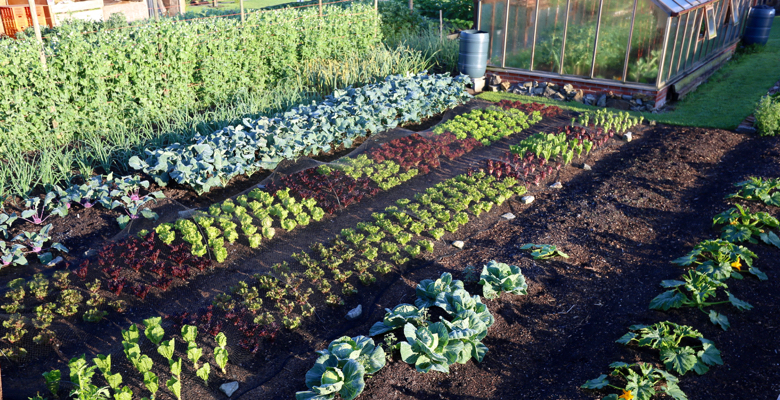 Around 20th to 25th August you can sow spinach, spring onion, spring cabbage to over-winter as small plants, for welcome harvests in the hungry gap next year. The power of cow manure! spinach plant in pure manure. 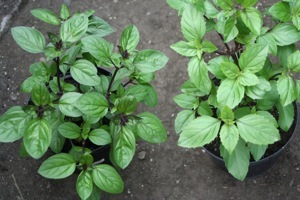 Cinnamon Basil on left in pure manure, on right in module compost, plants sown at the same time. If you are wondering why your beans have barely grown, the temperature records have answers: it was the coolest July since 1988 at least, and one of the wettest too. The first eighteen days saw rain every day from endlessly grey skies, and I have never known a summer period when growth of plants was so slow. Two types of plants suffered the most: those needing warm soil – summer flowers and vegetables such as climbing beans, all cucurbits, sweetcorn and tomatoes – and newly planted salads, brassicas, beans, everything recently set out, grew hardly at all. 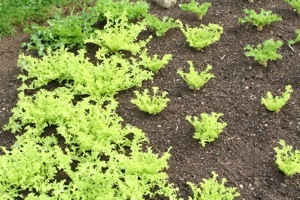 It was worrying from the point of view of supplying salad in late July but fortunately the spring sown lettuce kept producing longer than usual and an overlap has safely happened with summer plantings, thanks to a wonderful spell of dry warmth in late July, which is reminiscent of a similar spell in late May. Only I hope that August is not like June was! Wild rocket a year after sowing, in a polytunnel, a week’s growth. 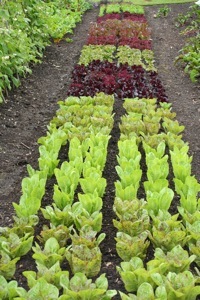 A lettuce bed planted July 6th, finally growing. 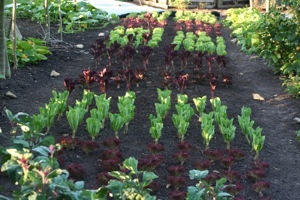 Bed of lettuce was planted March 28th, picked since early May. Mottostone planted July 6th and ready to pick. Outdoor tomatoes are probably not worth persisting with, except in parts of south east England. 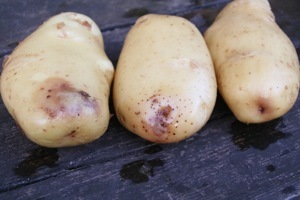 Blight is prevalent and all potatoes want harvesting, apart from blight resisting Sarpo varieties. Vales Sovereign grew well under a mulch of cow manure. These Charlotte have blight, entered where they were attached to the plant, and these tubers will rot quickly. 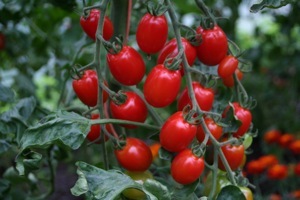 Indoor tomatoes need careful attention – water the soil only to keep leaves dry and blight free, remove lower leaves up to the bottom fruiting truss, prune long trusses which often do not ripen to the end, and stop plants now by removing their growing point, so that existing flowers and fruit can have time to ripen by early October, as long as plants stay healthy. …and then after the removal of their lower leaves, many fruit ready to pick. Onions want harvesting too. If they have mildew, as some of mine did, handle gently to keep the necks unbroken (otherwise rot may enter) and bring under cover to dry unless it is fine outside, which looks doubtful at present. 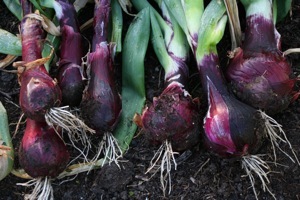 However do not bunch them until the stalks are well dry: I bunched garlic too early this year and fell foul of that awful, long spell of dampness, which meant that even undercover, no drying happened and I had to cut off the partly mouldy tops and lay bulbs to dry in the greenhouse. I trust it won’t be the same for onions. 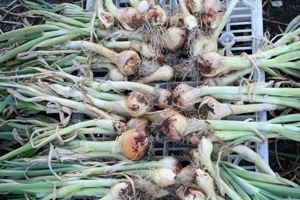 These Marco onions have mild mildew and will bulb some more. Red Baron (from seed) are healthy. Some vegetables have thrived in the moisture, such as beetroot and peas which love a maritime climate. 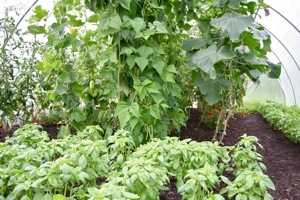 It is good to grow a range of vegetables so that something thrives whatever the weather! Parsnips are looking good but my winter kale and cabbages went in late and have barely established so far, way behind their stage of growth in all summers I have ever known, at this stage of the year. 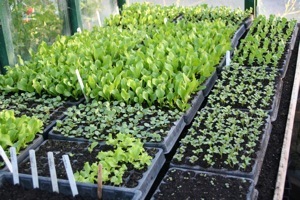 I am grateful to be a salad grower as lettuce has thrived and even basil is doing well in the polytunnels. 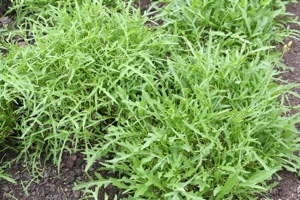 as is wild rocket, still cropping instead of flowering, as I cut it every ten days or even weekly. 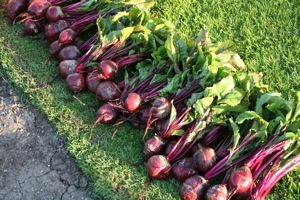 Boltardy beetroot was sown late March in modules. 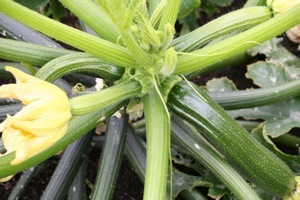 Courgette sown mid April, both were fleeced after planting for a month. 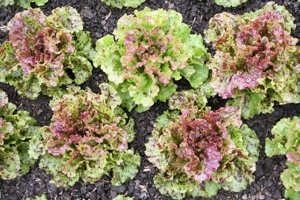 Salad sowings to make now include endive, chicory for leaf, ALL oriental leaves, rockets, land cress, winter purslane – almost everything except lettuce, in order to avoid autumn mildew. 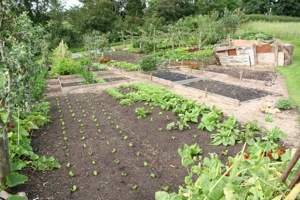 You can also sow turnips and winter radish until mid month, then spring cabbage and spring onions at month’s end. The last few days of August are good for sowing lambs lettuce and winter purslane to pick both in late autumn and through any mild spells in winter. 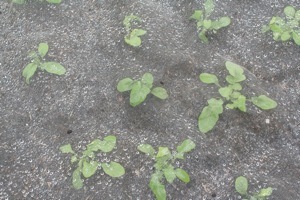 Module sowing/pricking out is reliable for plant raising. The rocket is protected by mesh against rabbits. I hope you are on top of weeds, which has been possible even this year in undug soil, where they germinate less. Having clear soil around plants with no weeds results in less slugs, although there are slimy monsters invading from many edges at this time of year and night time forays with a sharp knife are good for reducing their numbers.